What better company can there be? 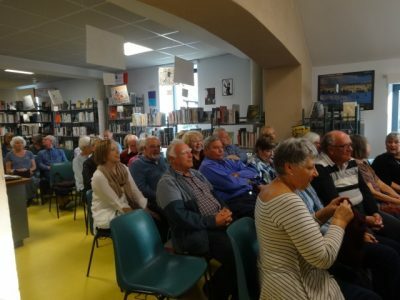 A delightful French village called Parisot, the well-organised Parisot literary festival with good companions, excellent food and wine – and BOOKS!! John and I enjoyed ourselves so much that I failed to get photos of the people I met and so you’ll have to do mostly with pictures of books. I have one good photo of John and me enjoying the opening event which was taken by my friend, Ginster. 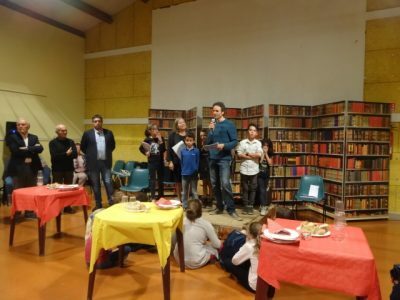 I was smiling at a group of schoolchildren who, together with their teacher and a French writer and illustrator, Thomas Scotto, had created two books for the event which had been published and were on sale there. There’s a great video of the weekend here which gives the flavour of the event. The festival worked so well for everyone and especially writers and readers – there was so much sharing and communicating with each other. For me, as a writer, it was supportive and encouraging. It’s hard to say which was most important because everyone and everything worked to make the weekend special. We stayed at the lovely Mas de Cazes with a beautiful natural swimming pool and no locked doors needed. 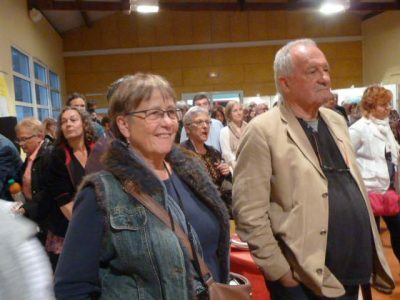 There we met Kate Rose of Charroux Literary Festival, Jane, a The Connexion journalist and Min Lee, a writer. 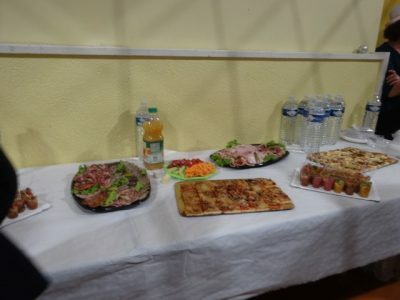 In Parisot we connected with friends from the Facebook Writers in France group like Harriet Springbett, Vanessa Couchman and Ginster and had wonderful discussions on every subject. Liz Stanley, efficiently, did the important work of organising and co-ordinating the festival and I met Andrew Lownie, the patron of the festival and a literary agent and author himself. I also met Lisa who runs Queens Park Books and supplied English books to Parisot – go to her bookshop when in London! First up was the glamorous, but unassuming, Fiona Lewis with her interesting memoir Mistakes were made (some in French) – Fiona’s life moved from ’60s London to Hollywood and then to the rebuilding of a French chateau. Apart from the ’60s London connection and the inevitable mistakes, my memoir will be rather different when it’s published. I listened to Luke Kennard with interest as he is also a poet and I enjoy poetry – looking forward to reading The Transition to see if it’s anything like Cull by Tanvir Bush. Keggie Carew’s Dadland is an extraordinary book – a very complex story about her father, brilliantly made readable. 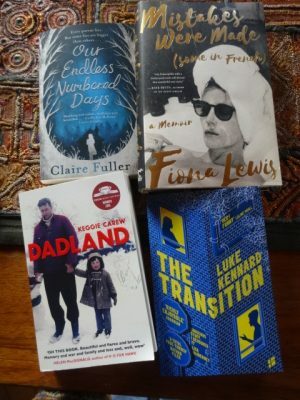 Claire Fuller‘s Swimming Lessons is on order but I did read at one sitting her Our Endless Numbered Days – highly recommended. Also remembered at the festival was Helen Dunmore, another poet as well as writer, who was an activist for freedom of expression but who sadly died this year. Last of all was Adam Thorpe another poet whose novel Missing Fay is one I will enjoy too. Too bad we couldn’t stay for Tracy Chevalier’s At the Edge of the Orchard but we had a 4 hour drive to get home and didn’t want to do it in the dark. And what about my own books and my search for readers? 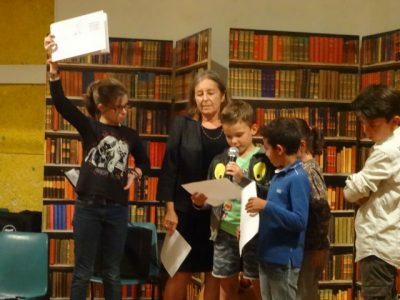 As a self-published writer I feel both hesitant and envious when I go to literary festivals. How do I rate myself as a writer and have I been rigorous enough about my own writing? Are The Shaping of Water and The Tin Heart Gold Mine good enough? Will I like the writers I meet and more important – will I like their books and learn from them? What about my own memoir When I was Bad? Well – the writers were all generous. They all said what hard work writing is but were ready to share their experiences. They all write in different ways – keyboard and longhand – with and without interruptions from social media – and they were all kind and supportive to me, an Indy author. I can only say thank you to the authors and the organisers and all the people we met – thank you very much! Comments below please from other aspiring authors!